immitated drums by using analog electronic circuitry to synthesize each drum sound with it's own circuit. As this technology was far form perfect, these types of drum sounds sound artificial and electronic - not exactly like the original drum. Beat Box artists fascinated by the sound often imitate these early machines. The earlier the machine, the warmer its sound usually. So: the unique imperfect electronic sound makes these machines perfect for electronic music, or for your unique sound and signature to your own music. As with all vintage audio equipment: these machines were composed with parts that now are nore than 40 years old. This means: due to age age these parts are prone to fail. So: Even if a vintage beat box is found still in working condition, that will not help much, as usually less than optimal sound and not fully working and due to age: it is falling apart - sooner or later (!) and needs to be refurbished before ti will work properly. The goal of my work here is - regardless of working condition - to address these age related issues by replacing as many age affected parts as possible (working or not) throughout the entire machine and to restore these parts, that cannot be replaced, to provide reliably and fully working equipment, which I aim to restore to perform as close as possible to original specifications and to work like when it was new. This is a high aim and often takes hours and hours and hours of work time to achieve. Prices shown here are based on the amount of work that a particular item took to restore / build / modify. Due ot the fact, that I not only restore, but custom modify, and have built these types of drum machines form scratch decades ago, I aim to offer really unique items here , but also offer to work with you for your very own unique sound and needs: to custom modify for your needs, or to improve original designs for less hum or noise, to add separate outputs, to MDIfy, etc. - at additional cost at my regular shop rate. Drop me a line if wanting your very own unique sound or features. Custom Made / Custom Modified + Refurbished! Early Vintage Analog Rythm Machine! Feature Details: (left to right): Down Beat indicator light, Switch (All toggle switches were part of the play automatic and were modified modified for the her ementioned): Claves on/off, Knob: Tempo control, Rocker switch: Silent/Sound (to star/stop), Switch: Low conga on/off, Switch High Conga on/off, Rhythm selctor buttons, white: WALTZ, SLOW ROCK, ROCK, MARCH, FOX TROTT, BALLAD, SWING, JAZZ; Rhythm slector buttons black: SAMBA, BOSSA NOVA, CHA-CHA, MAMBO, RHUMBA, BEGUINE, TANGO, Volume control (controls both chanles), Switches: Bass Drum on/off, Cybal on/off, Brush on/off, SnareDrum on/off. REAR PANEL: 1/4" jack for foot pedal; 1/4 Audio Outputs: Hi Instruments Out, Low Instruments Out; DC 30V in - Wolrdwide customers: If needing conversion for a different voltage: simply replace the supplied wall wart power transformer with one that will work for your voltage. Can advise. Super-Featured Original - Vintage Analog Silicon Transistor Sound! Description: Not your usual Rhythm Ace beat box. This machine offers much more!  Custom modified so that each rythms selector switch can be turned on and off at any time with ease for endless ryhtm variations by combining and changing ryhtms on the fly - perfect for life performance / composing.  In addition to the above: Each of the precussion / drum instruments can be turned on / off via toggle switches while playing - perfect for life performance, composing or for creating this special unique ryhtm.  This machien is stereo for amazing spacefilling ryhtms! (The Ryhtm Ace if comparing, or other similar machines are mono) Hard paned separate Hi instruments and Low instruments outputs - completely separate outputs enhance image and usability.  Machine has 15 pre-set rythms that can be freely combined and turned on/off.  Foot pedal jack that allows to reset to one, to silence or to let Hi-Hat play alone.  Vintage USA made Hammond Instrumet. This is probably the most versitile vintage analog drum machine that I ever created! You won't find a vintage machine with these options anywhere else - It is unique - Not available. It is stand alone and it is custom modified! It features separate outptus for stereo rythms - one side has the high sounding instruments and for the lower drum instruments. 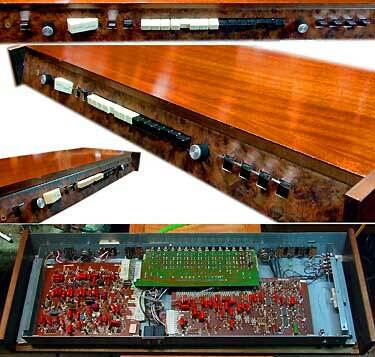 Fully refurbished, then custom modified so that each of the percussion / drum intruments can be turnted off separately. In combination with the 15 rhythms (- that can be combined / turned on off while it runs! -) This machine offers an nearly endless aresanl of different rythm and sound variations. Also to mention that turning instruments off and on while playing allows for sparkly life performances or to create electronic dance music. Now imagine that you add a phaser to the high output and maybe a flanger or delay to the low output. Anaolog vintage electronics heaven! This machine comes form the early days of electronics when all circuitry was built descrete with single transistors. So sound generation in this machine does not imply any ICs. There are only 3 ICs in this machine and they only help with the rhythm generation - most of the ryhtm generation circuitry is still constructed with transistors (! ), which gives: A treuly early analog machine and truely sound that matches that. This machine appear to have been manufacutred in the USA (compared to other machines of the same time aera that were Hammond branded but made in Japan by Ace, such as the FR-D2 or the Rhthm Ace). Also to note that the machine offered 2 separate outputs, which I routed to the back panel in form of 1/4" jacks for acess and for your enjoyment. There was circuitry for some weird foot pedal control that I made acessible with a 1/4" jack for a foot pedal. The way it operates is unusual: when depressed it re-sets the rest of the machine to the first note to be silent, but continues to beat the HiHat (if turned on) So: This cool feature adds to the versitility of playing this beast life! A truley unique machine that you would not want to miss (Most likely I will not ever make another one just like it!). Very Cool sound! Oh, I forgot: I made it's wooden casing form scratch from wood that came from another vintage instrumet form the 50's! The sound of this analog drum machine is truely convincing vintage-electronic. Now imagine to use external effects processing on top of that! Distortion, Phasing, Flanging, Echo, Delay - It can't get any betther than this, and if seeking unique vintage electronic sound and un matched vesitility: THIS is your machine! . Work that went into this machine to present it as described and shown: First this machine had to be modified to work independantly form the organ it came from. Then custom power supply circuitry had to bew built. Even though fully working when modified: I replaced ALL (!) electrolytic capacitors in audio and generator circuitry to prevent issues that develop due to aged electrolytics. Replaced many signal coupling caps as well. This also restores sound quality to when it was sold new. I repaired one instrument which was not working properly. I custom tweaked the circuitry of two instruments to improve their sopund, I replaced aged internal trimmer potentiometers, I deoxydized and lubricated all controls, switches and internal trimmer potentiometers for long term reliability. I re-soldered all aged solder points to prevent issues due to aged solder. I custom modified the machine by: removign and replacign all rhythm selector switches form lathed release types to holding (on/off types; this alone took more than a whole work day to complete) I removed circuitry and wiring not needed in a stand alone configuration and I modified all switrches to turn off any one of the instruments separately. I cusotm made an internal adapter that allows to still service the machine with this modification, I had to custom fabricate one switch (farthest right) and custom fit it as the original switch was damaged. I performed all electronic adjustments. I custom fabricated the machines wooden casing. Machine thoroughly testested (I used it in my studio for a while to break in the new caps and to throughly test it!). this machine is ready to perform for decades to come! If you are into electronics: It is failry easy to custom taylor the sound of this machine or to even install potentiometers that allow to alter the sound. Lot: 1 vintage Hammond USA made Rhythm machine, as shown and described (includes wall wart 30V power supply for 117V AC - I Can also supply transformer for different World voltages). Completely Analog and no ICs! - Refurbished!  (left to right, top to bottom): Sound/Silent rocker switch, Down beat indicator lamp, Tempo potentiometer, Red buttons (Latin Rhythms): Samba, Bossa Nova, Cha Cha, Mambo, Rhumba, Beguine, Tango; Black button: "Add Bass Drum"; White buttons: Waltz, Slow Rock, Rock 'N Roll, LATINS (red), March, Fox Trot, Blad, Swing, Jazz; Rhythm Start / Stop (black round button); Volume; All rhythms can be combined if pressing in several buttons at a time - this provides almost endless possiblities of sound and rhythms.The top plate (drawer slide) can be removed if wantign a free standign unit - otherwise it can be mounted to the bottom side of the top of a desk - then it will work like a drawer that exposed the controls of the machine when open. Other: 1/4" jack for audio out - Two 1/4 outputs: one direct and the other via the volume control; Cable connects control unit with the sound module and there is a cable that connects the power supply to the main (sound) module. Currently power suppl yand main ubnit are mounted on a wooden plate for "plug and play" ready operation. AC power chord for 110 V AC - If needing conversion for a different world voltage: please let me know and I will be able to supply whay will be needed. Description: This Hammond Rhythm II was manufactured by Ace (printed in small leters onto the model plate) and it is almost indentical in circuitry and sound to the famous Ace Rythm, except this one is way cooler: it takes very little desktop space as housed in a "drawer" and has all of the latin rhythms separateyl accessible in form of it's red buttons. 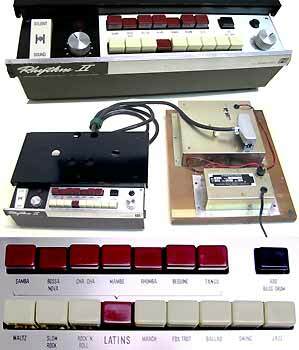 The rythm II is considered to be one of the early drum machines: All transistors, ground positive. There are no ICs in this machine and there is a lamp used for the down beat indicator. There are 3 units connected to each other: the ryhtm generator, the sound unit and the power supply. This allows to place the control unit where ever, requirign very little space and to put the board with power supply and audio circuitry elsewhere up to 20' away. The sound of the Rhythm II is very analog and drums are very warm and liquid remiding of early ROLAND machines. Equipment that is 40 years old, even if aparentrly working, usually develops quite a few of issues (noise intermittency, distortion, fuzyness, poor sound , malfunction, etc.) - In order to take care of that his machine was completely refurbished to perform reliably and to prevent any age related issues - You will not be able to find a unit in better working condition! The Ryhtm II as assembled operates stand alone, offers a wide variety of sound and is plug and play to be used with an amplifier on stage, can be installed into an organ, or hooked up to a mixer in the electronic musician's analog recording studio! the machine provides two 1/4" outputs: direct and via the volume control. Condition: Good toExcellent physical condition, very clean; works perfectly. Fully refurbished for long term reliability. (see "work peforemd" below). ALL electrolytic caps in the unit were replaced! There is a slight hum due to the orignal design of the unit. With additional charges I can remedy this with a modification by re-configuring the grounding scheme, which currently is based on chassis ground. Work performed (to present this unit in perfect and reliably working condition): Even though fully working when received: I replaced ALL of the electrolytic filter capacitor throughout the entire unit (3 chassis), to prevent issues that may develop due to aged components. I deoxydized and lubricated all controls, switches and internal trimmer potentiometers for long term reliability. I perfromed adjustments and calibrations, Thoroughly testested. Lot: 1 vintage Hammond Rhythm II Beatbox Drum machine, as shown. OR: Quick Check Out Shopping cart button below will bill you $414 ($349 + $65= Shipping DEPOSIT) Payment processed through PAYPAL. With Payment I will: pack, then calculate actual shipping cost to your ZIP code (within continental USA only! ), refund the shipping cost over payment (if any), SHIP and e-mail tracking number. I reserve right to cancel order by refunding your entire payment. If need to approve shipping costs, before I ship, please use: Buy/Inquire instead. Please READ and agree to All details before proceding here. 1982 Analogue Electronic drums Retro Set. For those of you who get exited about this vintage electronic kit, but do not know much about it: First introduced in 1982 and sold probalby until '85. 80's electronic drum sound - not sample based: compleltey analog! Famous for it's 80's modulated Tom-tom sound. The pads are touch sensitice and different patterns can be programmed into this machine by simply palying. Play with your hands, or with sticks, or if not inclined to plat or want to program a pattern: by pressing individual drum control pattern generator buttons. Recording happens in a loop fashion and you can add more and more elements as you go along. Also perfect for programming a basic pattern to play along with live. The unit has bass drum, a tuneable tom-tom (over 4 octaves! ), a cymbal (closed or open hi-hat type sounds - use accent botton for closed hi-hat sonds), a snare drum and another tom. There is a headphone jack and stereo audio outputs, plus an acessory jack. The unit is fully portable, as it runs on batteries, but can also powered with an AC adapter. This machine is used by a lot of retro bands, rumors has it that it was used by Kraftwerk as well, and is a desired object for circuit bending and modifications. Work performed (to present this unit in perfect and reliably working condition): De-oxydized control sand switches. Physical cleaning and detail work. OR: Quick Check Out Shopping cart button below will bill you $83 ($55 + $28= Shipping DEPOSIT) Payment processed through PAYPAL. With Payment I will: pack, then calculate actual shipping cost to your ZIP code (within continental USA only! ), refund the shipping cost over payment (if any), SHIP and e-mail tracking number. I reserve right to cancel order by refunding your entire payment. If need to approve shipping costs, before I ship, please use: Buy/Inquire instead. Please READ and agree to All details before proceding here.  255 Sample Based 16 Bit Sounds w/ editing - Great Sound! 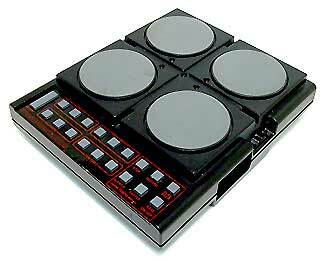 Description: A full features professional drum machine with amazing sound. 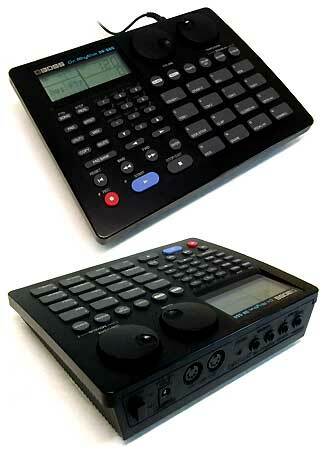 Program it or play it with the built-in pads (or an external Midi controller). Perfect for guitar players, song writers, and othe rsolo musicicnas and bands to add professionally sounding drums to their music. Boss is a sub-division or Roland corporation. Condition: Sorry about the poor image - due to image compression. Will be glad to e-mail Hi-Res photos - Inquire. Actual machine shown though. Physical condition: Very Clean with only minor signs of use. Working condition: Works perfectly. Was refurbished to address typical age related problems for reliable and fully working perfomance. Work performed (to present this unit in perfect and reliably working condition (and to qaddress typical aged related problems): Restored the data input encoder for proper operation. Replace the internal back-up battery. Re-soldered aged solder points. De-oxydized potentiometers. Physical cleaning and detail work. Lot: 1 Boss DR-660 drum mnachine plus the original Boss AC power adaper (117V). OR: Quick Check Out Shopping cart button below will bill you $102 ($78 + $24= Shipping DEPOSIT) Payment processed through PAYPAL. With Payment I will: pack, then calculate actual shipping cost to your ZIP code (within continental USA only! ), refund the shipping cost over payment (if any), SHIP and e-mail tracking number. I reserve right to cancel order by refunding your entire payment. If need to approve shipping costs, before I ship, please use: Buy/Inquire instead. Please READ and agree to All details before proceding here.